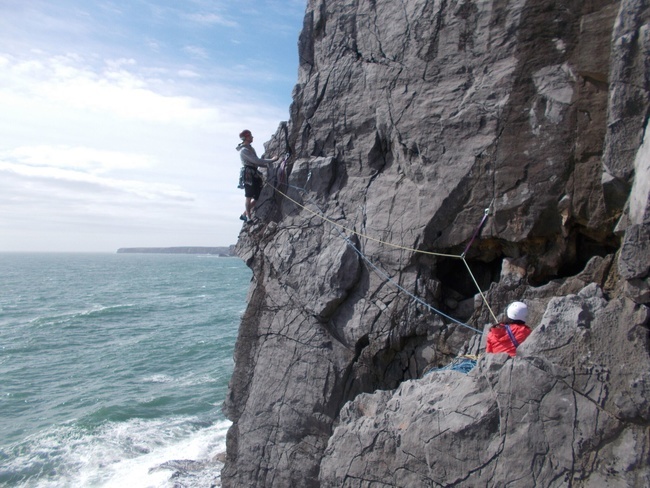 South Pembrokeshire has some of the best climbing in the country! We were lucky enough to experience it even though the weather forecast was against us. Jake, Robin and Geoff got several routes in on the polish free limestone at Saddle Head. Sea Mist HS 4a was ascended and reascended by Paul & Elaine and Nick & Geoff on Saturday. Geoff left Jake and Robin to tackle the classic 2 pitch VS Blue Sky. The attempt didn’t go to plan after the duo couldn’t completely retrieve the ropes after abseiling in to the committing route. Using the ends, the guys managed to climb out on the much less friendly (depending on which book you take the topo from at least!) HVS Eaves Dripper. Meanwhile Nick, Dave & Mike had arrived and went straight to Stennis Head to sneak a route in, even though it was 8PM. It was nice to stretch the limbs after a long journey [North Corner VD]. Paul and Elaine arrived well after dark and opted not to do a midnight ascent of any climbs. With the team established only a couple of miles from the cliffs, it was a waiting game with the weather. Late morning the drizzle started to slow and the sky brighten. Jake and Robin headed to Stennis Head to tick off several VS routes and the classic HS Myola, Jake not quite avoiding getting wet feet at the tidal belay outside the entrance to Huntsman’s Leap. Nick, Geoff, Paul, Elaine, Dave and Mike went to Saddle Head. Nearly every route in this area has at least one star! The first route was done under a layer of cloud. Paul leading 101 S 4a, Mike led Small Beginnings VD, which Nick also warmed up on one Dave had completed his ascent following Mike. Incredibly, the sky turned blue and the clouds vanished. Sea Mist, as mentioned, was repeated, Nameless Wall HS 4b was climbed by the three pairs, virtually all of the corners to the right of Pink ‘Un saw at least one ascent, if not more. The final climbs of the day were completed after 8PM. All pairs completed lots of routes in the sunshine. It was such a contradiction to the dull start to the day. What made the day extra special was we didn’t share the crag with anybody! Sunday dawned damp as the forecast indicated. A quick reshuffle of car sharing meant those that wanted to head homewards could do. Dave and Mike stayed on to see if the weather would improve. It did do by about 1PM. They went to the Stack Rocks car park and spent a while trying to locate the Flimston Slab. It took a while, but Dave’s determination was rewarded with finding the elusive slab. 2 30m+ routes were climbed. Neither was particularly hard, but they were in a stunning location. Both Flimston Slab VD and Flimston Crack VD started from a hanging belay at the high water mark. 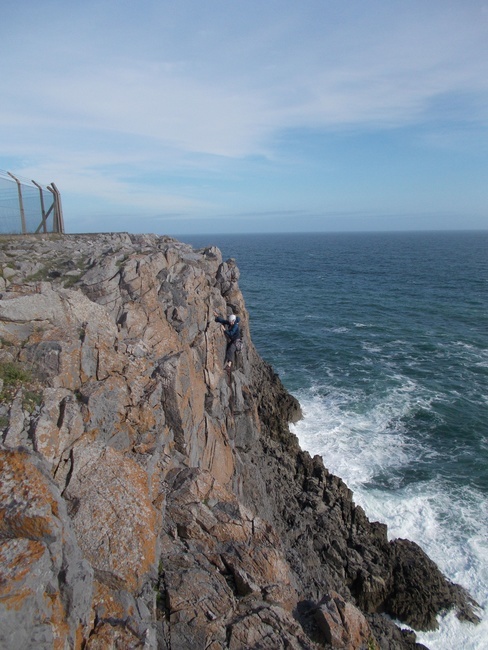 The climbing took place in the sunshine and surrounded by guillemots, gulls, seals, sky larks and other wildlife. Thanks go to Nick for taking over from Andrew who had organised the trip, but sadly couldn’t attend it. Nick did a sterling job keeping the team informed on the plan for the weekend, making sure people had partners and ensured those that wanted food in the pub could eat. It was a tricky role due to the unpredictable weather. He recognised that the late start would mean a late finish on the Saturday, so he moved the pub booking to the climber friendly, St Govan’s Inn in Bosherston. Those that had been to the area were glad to return and the team members who hadn’t been before vowed to go back to this stunning location.